The Amazon Echo was initially introduced in the tail end of 2014, to US based Amazon Prime members, initially as an invite only affair. While limited at the time, Amazon have continually updated and improved the Echo prior to a wider release in the summer of 2015, allowing third party companies to add their own twist on things, via what Amazon call Skills. Finally, we had the UK launch last month, with a discount to Prime members, lowering the cost from £149.99 to just £99.99 for the first two days it was available to pre-order. As something of a fan of smart home functionality the wait was annoying, but actually to the benefit of the UK market (in most areas) since it has given Amazon a chance to bring a pretty mature and solid product to market. The Echo ships in a black box, with a slip on cover featuring a blue triangular motif, adorned with a picture of the unit itself and various commands you can use with the Echo on the front, product features and some supported skills on one side and the various virtues of the echo listed on the rear. Internally the packaging is a similar shade of blue, with the star of the show clearly presented on opening, in addition to the Echo there are a few simple manuals and some regulatory paperwork and the power supply. The Echo itself is a fairly unassuming looking device, measuring 235mm tall and 83mm wide. At the top we have two buttons, one for disabling the mic, and another which has various functions depending on what it is you are trying to achieve. Around this there is a small ringed grill, which allows the internal mics to pick up your commands, the light ring, which can cycle through various colours and is used to as a status light which provides feedback on what the Echo is doing, surrounding the light ring is the volume ring, a continually rotating ring which, well, adjusts the volume of the echo from 0 to 10. About half way down there is the speaker grill, which wraps around the unit and finally the amazon logo upfront and a power LED around the back. The base is rubberised so as not to scratch any surfaces you would put the Echo on. Weight wise, the Echo is actually surprising for its size, clocking in at 1.7 lbs. Ultimately Amazon have designed it to be fairly unobtrusive wherever you may place the Echo in the home, while still being reasonable attractive and offering visual feedback in a clear and noticeable way. Internally, thanks to an iFixit teardown we have a pretty good idea of the devices internals, which can help form an understanding of what to expect from the unit, 7 mics at the top of the unit assist with listening out for user commands, with support for user positional tracking, a 2.5” sub and 2.0” tweeter supply the audio, which I go into a bit more detail on later. Set up was reasonably simple, relying on a companion app for your smart phone or tablet, the app walks you through pretty much every step needed, and uses a Wi-Fi network broadcast from the Echo as part of the set up process . All in all, this was at most a five-minute job. In a similar view, Bluetooth setup was also one of the more painless I have experienced to date. Once set up is finished, the only real time you will need the app is to add additional Skills to the Echo, check command history or control the Echo when away from home, something I’ve had some slight fun with by making the Echo start playing music while my fiancé was home alone, much to her annoyance. One thing to note here, the US version of the Echo ships with a remote, the UK version however does not. I am unsure as to why this actually is, but it wasn’t missed, so likely makes little by way of difference to the devices operation. 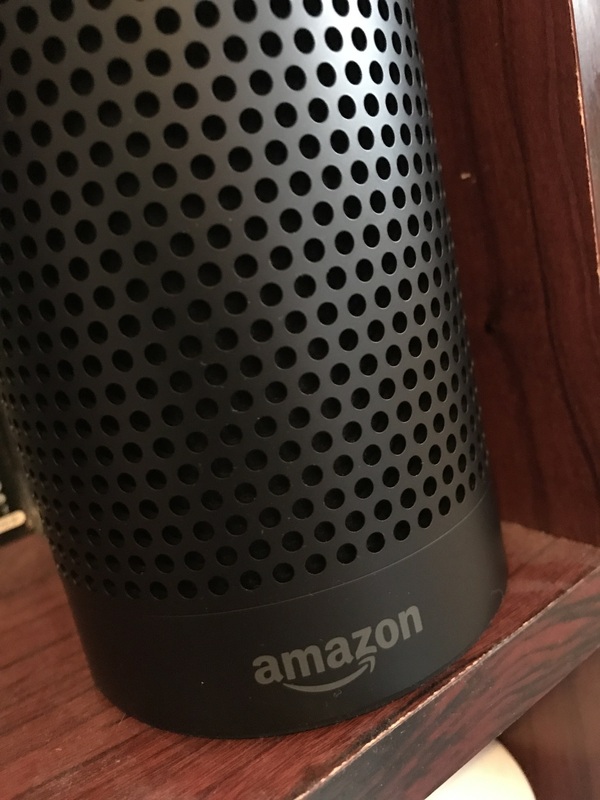 Due to the device relying on trigger words to initiate its listening mode, you will need to precede any requests with either Alexa, Amazon or Echo depending on which you set in the app. Initially this felt clumsy, but it becomes more natural with use. At its default the Echo will allow for alarms to be set, give you the current time of day, get weather and news reports as well as listening to music. Phrasing seems to be largely down to personal choice, though I have noticed some slight inconsistencies and niggles here and there. You can also use Alexa, Amazons cloud based computing system which the is powered by, to check on orders with Amazon, add items to shopping lists and perform a few seemingly gimmicky features like telling jokes and similar. You can also add more personalisation to some of the things Echo can do, via the app, such as adding home and work addresses, favourite sport teams, news source, linking calendars and such. This is before we get into the Skills that can be added or smart home functionality.